TVNZ isn’t revealing how many streams of Doctor Who there have been since the 11th season launch on-demand on Monday. Its linear broadcast begins tonight (TVNZ 2, 7.30), four days after the first female Time Lord’s debut topped the ratings in the UK. Jodie Whittaker’s Doctor unleashed 8.2 million viewers and a 40.1% share for BBC One, smashing the performance of recent airings, Deadline reports. It was the first Sunday evening screening of Doctor Who in its 55-year history, The Guardian says. Doctor Who was a staple of Saturday night TV during its original heyday in the 1960s and 1970s. A move to midweek during the 1980s, when the show was pitched against ITV’s Coronation Street, is often blamed by fans for the show’s fall in popularity during the decade. Since being revived by the BBC in 2005, first under Russell T Davies and then Steven Moffat, it has always been part of the BBC’s Saturday lineup. The last two seasons saw a noticeable dip in the show’s ratings, with episodes attracting between 5 and 6 million viewers, down from the 7 and 8 million it regularly attracted during the 2000s. When BBC America simulcast the episode with the BBC and a New York Comic Con screening, it “grew quite a bit” from the season 10 premiere, according to The Hollywood Reporter. The series premiered at 1:45 p.m. ET Sunday and drew 1.37 million viewers and a 0.45 in the 18-49 demo. That’s up 48 percent in viewers over last season’s 921,000 and 40 percent in the demo versus 0.32. 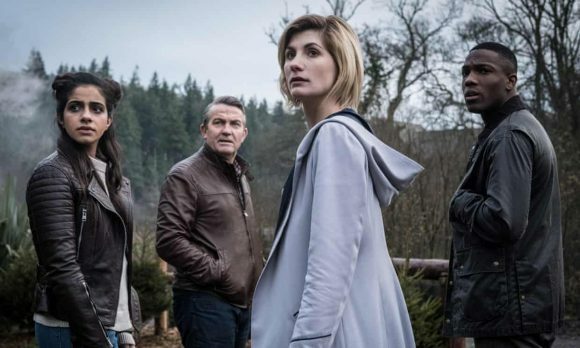 A primetime re-airing of Whittaker’s first episode drew an additional 515,000 viewers and 0.15 in adults 18-49, bringing Doctor Who‘s total for Sunday to 1.88 million viewers and a 0.6 in the demo. TVNZ OnDemand started streaming the season premiere on Monday morning, as soon as it went up on the BBC’s iPlayer. But the broadcaster won’t be revealing how many times it’s been streamed until after the ratings are in for tonight’s telecast. “We want to wait until we have a week’s worth of data for Doctor Who to look at as well as the TVNZ 2 overnight ratings for Friday,” a spokeswoman says. Well, I watched it so that’s one at least.